Accompanied by four teachers, 43 students of the advanced A Lyceum English classes, visited England between 22 and 26 of March 2019. The weather being on our side from the start, we arrived in London, and immediately left for Oxford, our first destination. Here, in this renowned University city, students went on a guided tour of Christ Church College and had time to stroll around the city and its numerous landmarks and colleges. 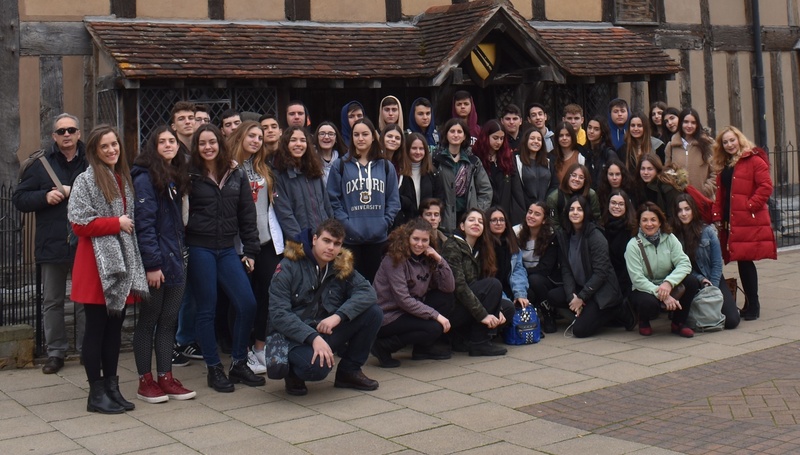 After that, the group headed for Stratford-Upon -Avon, Shakespeare’s birthplace, where students marveled at the mixture of medieval, renaissance and modern architecture. During our two days there, we visited Shakespeare’s birthplace, his home with its exquisite gardens, his school and Guildhall, Holy Trinity Church, where he is buried, and Mary Arden’s farm. The students enjoyed a traditional dinner in an English pub, and had time to walk along Henley Street. We also had the pleasure of watching “As You Like It”, a Shakespearean comedy, at the Royal Shakespearean Theatre. 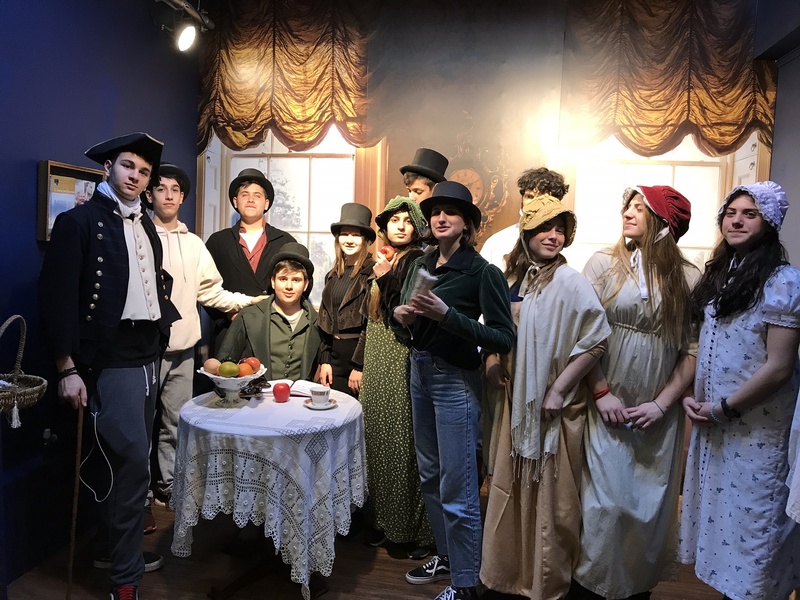 Our third and fourth days were spent in the beautiful city of Bath, where we roamed around the Roman Baths, visited the Jane Austen museum, where our students enjoyed dressing up in Regency-era clothing, and spent the afternoon having ‘high tea’ with scones and clotted cream in the Regency Tea Room. We also had a guided tour round various sites, such as Pulteney Bridge and the Royal Crescent. During our trip, we also visited our hosts’ high school, Clevedon High, in Bristol. 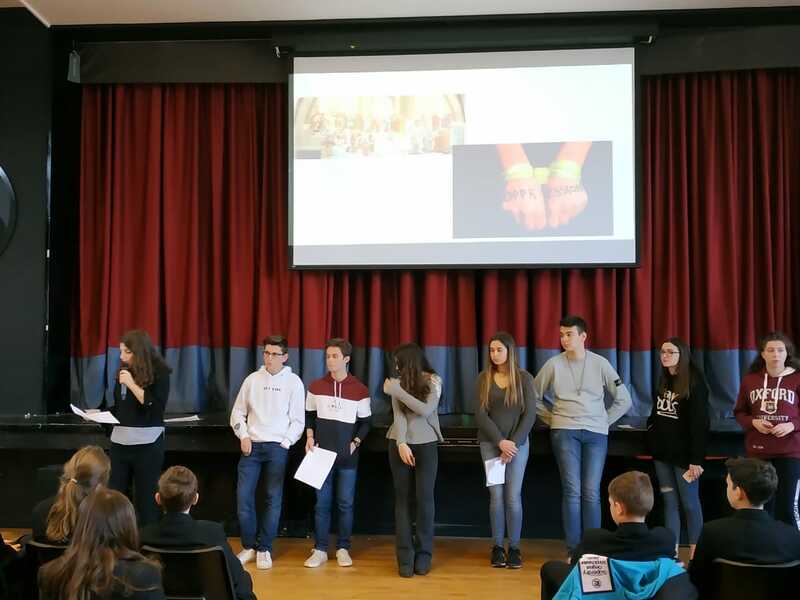 We observed some of their classes and on the 25th March, our students gave a presentation informing them of what we celebrate on that day. Other highlights of this visit were the long walks around the picturesque town and pier, and the sight of English and Greek students dancing together to Greek music at the end of the presentation. Our last day was spent, firstly, in Salisbury, where we visited the magnificent cathedral, and then, it was off to our last site, Stonehenge, with its awe-inspiring ancient structures, from where we departed for the airport a few hours later.